In times where we can find examples in developing countries that oil is cheaper than drinking water, ARE believes that, to turn the COP21 Paris Agreement into a success story, it needs two concrete actions. In times where we can find examples in developing countries that oil is cheaper than drinking water (FAZ, 13 Jan), ARE believes that, to turn the COP21 Paris Agreement into a success story, it needs two concrete actions. Firstly, in full recognition of the results achieved at COP21, the rural population in the developing world who do not have access to energy should not be forgotten when trying to shape the future of the planet. Secondly, as a response to the first recommendation, the creation of the necessary frameworks and the experiences with the effective deployment of decentralised renewable energy technology solutions will be vital. The rural population should be given the opportunity to make their own choices between sustainable environmentally-friendly solutions available and offers from the past. ARE and its members have worked hard to create and deploy technology and business models for the successful roll-out of advanced energy access at the needed scale. To discuss appropriate ways to bring the private sector into a real investment position, the ARE-RECP Off-grid Investment Forum in Amsterdam on 12-13 April 2016 will allow participants to understand where opportunities lie and how they can make use of them. We are delighted that Ms. Rachel Kyte, new SE4All CEO, has accepted our invitation to present her views and next steps of the SE4All initiative on energy access (Climate Home, 28 Jan). To celebrate ARE’s 10th anniversary, participants will be invited to join us and take a retrospective look at the key milestones of the last decade at the evening reception on 12 April 2016. ARE is recognised as a key partner and remains committed to bring in private sector expertise. To reflect this, ARE has been selected to lead the newly established Energy Access Workstream of the Africa-EU Energy Partnership (AEEP). In this regard, we recommend to take note of the business cases shown in this newsletter from ARE members Rahimafrooz Renewable Energy and Studer Innotec. The Alliance is a membership-fee based organisation and welcomes more organisations to support us and join us in our efforts to achieve SE4All objectives (ARE Presentation; Membership Form). Since the last edition of the ARE newsletter in December, we are happy to welcome again four new members. Finally, before drawing particular attention to the co-editorial by ARE Board Member and Chair of the Steering Committee of the African Renewable Energy Alliance (AREA) Anthony Ighodaro, please join us in the making of the future editions of the ARE newsletter. To find out more about the future topics please click here. The demographic forces of youthful population growth and turbulent population displacements on the one hand, and a global economy to be weaned off its traditional reliance on fossil fuel power generation on the other are driving the problems of universal access to energy. Demographic forces of youthful population growth and turbulent population displacements on the one hand, and a global economy to be weaned off its traditional reliance on fossil fuel power generation on the other, within the constraints of the COP21 agreements, are driving the problems of universal access to energy, water and food. This is against a slow economic terrain where low oil prices simultaneously sap incentive to switch to Renewable Energy (RE) and deprive oil-exporting countries of the revenue to invest in RE power generation. Citizens increasingly realise that they can no longer rely on governments to provide or create jobs, and that “self-help” is a precondition to improving livelihoods. Because of their greater vulnerability to natural and man-made disasters, developing countries often look helpless; but decentralised RE technologies (RETs) can literally empower them. The African Renewable Energy Alliance (AREA) is an online platform for self-help. Created to accelerate the uptake of Renewable Energy in Africa, it was formed in Ethiopia in 2009, after a strategy conference convened by the World Future Council, the Alliance for Rural Electrification and the Heinrich Boëll Stiftung. It has now grown organically to more than 2,200 members from 101 countries. Its membership by sector is 7% Policy, 60% Business, 18% Academia and 15% Civil Society. Its top 10 countries by number of members are Nigeria, the United Kingdom, South Africa, Germany, United States, Kenya, Ghana, Ethiopia, India and France. It is run by a 15-person Steering Committee representing Africa and the Rest of the World. The information exchange which takes place on the AREA member intranet enables users to promote their ideas, events, services, products and tools, and to seek collaborators. AREA’s activities and resources, such as its 2012 Bellagio Conference and library, have successfully harnessed international and intra-African expertise. As nations embark on the Sustainable Development Goals (SDGs) with the prospects of multi-billion-dollar funding to fight global warming, we all need to ensure that the money is directed towards transformational change. Announcements of signed Power Purchase Agreements (PPAs) for multi gigawatt projects and associated gifts, in Nigeria and Kenya, have raised the spectre of past predilections for large projects. Stakeholders must ensure that governments are not inveigled into “gung ho” commitments. South Africa’s Renewable Energy Independent Power Producer Procurement Programme (REIPPPP) has shown the scale and speed with which RETs can be deployed on-grid and be, crucially, 100% financed by the country’s private sector, mainly from local resources while avoiding “white elephant” projects. The challenge for Decentralised RETs now, is to demonstrate not only that they also can be rolled out speedily and at scale, but that they can deliver tangible community benefits, resilience, and socio-economic development; and for a fraction of the cost of grid-extension. Rahimafrooz Renewable Energy Limited has been playing a pivotal role in the dissemination of solar hybrid mini-grid projects in rural Bangladesh. Rahimafrooz Renewable Energy Limited (RREL) has been playing a pivotal role in the dissemination of solar hybrid mini-grid projects in rural Bangladesh. A mini-grid project (80KWp) is planned on the Muradpur Island to provide sustainable and affordable access to energy to 310 underprivileged households, introduce electricity to 40 shops for commercial activities, and power 10 irrigation pumps to boost agricultural productivity. Basic healthcare will also be guaranteed as the mini-grid will provide power to a community health clinic and three primary schools. The overall economic activities are expected to be enhanced, with up to 2,000 tonnes of CO2 emission saved per year. Figure 1 shows the business model where RREL and Rural Services Foundation (RSF) form an Energy Service Company (ESCO). Energy will be sold on a prepayment basis for a minimum period of one month and will be credited through the prepaid smart card from the vending station located in the project office and/or vending kiosk at the local market. The impact of the planned rural mini-grid is enormous. Schools can now be equipped with computers, printers, and other audio-visual teaching aids and students can study longer time at night. A mini-grid also facilitates internet usage in remote rural areas resulting in a better social awareness and improved knowledge for the villagers. Vaccines and other medication requiring refrigeration can now be stored safely at the rural health clinic. Villagers are using television and other forms of communication devices to remain connected with the country and the world. Commercial activities have already been extended till late at night, contributing to the overall emancipation of rural communities. Solar mini-grids can reduce the high capital expenditure of grid extension to remote areas where low density populations live. It is estimated that over 500 solar mini-grids can be implemented in Bangladesh. In conclusion, mini-grids can truly develop the rural economy by providing the rural masses with the opportunities to generate income and improved quality of life. Better health and education services and empowerment will take place as a supplementary effect. Moreover, the prolonged working hours at the local bazaar will ensure increased business and its spiralling effects will impact the local economy positively. ARE was invited to the workshop at Trinity College of the University of Cambridge, to examine the main opportunities and challenges in establishing viable business and financial models for ‘Smart Villages’ in developing countries, and what innovative approaches are emerging to meet these challenges. ARE Policy & Business Development Officer David Lecoque addressed off-grid renewable energy business models and showcased successful ARE member case studies. The work of the Clean Energy Mini-Grids (CEMG) High Impact Opportunity (HIO), where ARE is a steering committee member, as outlined in the Annual Report for 2015, is making a significant contribution to the SE4All objectives. CEMGs offer an excellent example of how to link advanced technology with the goals of advanced energy access and socioeconomic development. The HIO Annual Report, which was launched by ARE Executive Director Marcus Wiemann at WFES on 19 Jan 2016, shows the highlights of last year’s activities including the mapping of clean energy mini-grids support providers and programs, the launch of the UNF Energy Access Investment Directory and the Green Mini-grids Programme supported by DFID. At EURELECTRIC’s conference, representatives from public and private sectors, as well as the EU institutions and NGOs, will discuss the EU’s strategy and efforts with regard to providing access to electricity in developing countries. ARE President Ernesto Macias is invited to share the decentralised energy sector experiences in the deployment of utility business models for access to electricity. The use of household biogas and bioslurry has expanded across African countries. Biogas activities have been present in Rwanda, Cameroon and Benin, and more recently, biogas projects have kicked-off in Zimbabwe and Zambia. A growing number of enterprises are delivering quality products and services to meet the increasing demand for sustainable biogas solutions; national markets are emerging. Against this background, Policy & Business Development Officer David Lecoque will participate in the conference in Addis Ababa, Ethiopia. ARE and the Africa-EU Renewable Energy Cooperation Programme (RECP) are co-hosting a series of free-of-costs events to promote decentralised renewable energy technologies and cooperation. With the growing success of ARE’s business matchmaking forums and energy access workshops, ARE events have become the platform of discussion in the decentralised renewables sector. This year, ARE will host its Energy Access Investment Summit at ING Headquarters in Amsterdam. Keynote speakers Ms. Rachel Kyte (SE4All), Mr. Roberto Ridolfi (European Commission) and Mr. Kees Rade (Ministry of Foreign Affairs of the Netherlands) will introduce a discussion where participants will be invited to exchange and to prepare key recommendations on how to best work towards stronger cooperation between the public and private/finance sector with the goal to mobilise needed investments and engagements in the field of energy access. The RECP, of which ARE is a key partner, is hosting a business and finance matchmaking forum that will bring together project developers, technology suppliers and service providers from the off-grid sector with financiers and investors. RECP will invite not only African entrepreneurs looking for project partners for off-grid electrification projects, but will also actively mobilise key international funding programs, as well as commercial investors. For the updated programme, kindly consult the event page. As seats are limited, we advise interested participants to reserve their spots by registering here. The booklet provides a comprehensive summary of the clean mini-grids projects being implemented in the region through the ECOWAS Renewable Energy Facility (EREF 2). EREF is a grant facility managed by ECREEE which provides grants for small to medium sized renewable energy and energy efficiency (RE&EE) projects and businesses in rural and peri-urban areas in the ECOWAS region. Isolated diesel systems are the main electricity generation method in many rural areas nowadays and represent a viable option to supply un-electrified villages in the Global South. However, this generation scheme leads to a dependency on fossil fuels and their price volatility on a global market with a projected increase of costs in the future. This study takes a look at the overall global potential for solar–battery–diesel mini-grids for rural electrification and derives a comparative analysis of the respective regions. 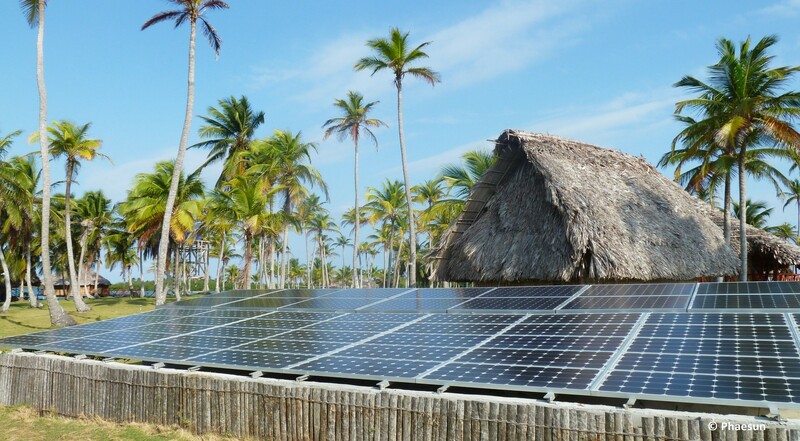 This report explores the potential financing mechanism options that can be employed to catalyse more private sector investment in clean energy (renewable energy and energy efficiency) in the small island developing states (SIDS). The objective of this report is to identify and assess options that can help increase investment in renewable energy and energy efficiency in SIDS through the adoption and funding of financing mechanisms by SIDS and development partners with special attention given to the role that the private sector can play.